SBE-PV Solar Energy Solutions are designed for installations where the cottager or home owner will utilize a battery system to store the electrical energy produced by the photovoltaic (PV) panels. Use the Power Consumption Calculation (see button above) page to determine the size of system you require. Then select your system from those listed below. Note that the Watt Hours shown below are estimates based on a normal day. 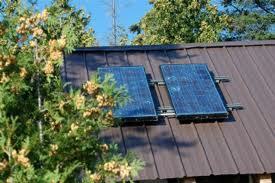 The simplest and most reliable way to put solar to work at your home or cottage is a SBE-PV Solar Energy Solution! These kits are designed for fast, easy and fully code compliant installations. With features such as quality solar, strong solar mounting systems and battery charge protection, you'll have the very best equipment in an integrated solar power system. Larger packages come complete with DC-AC inverters, allowing full integration with generators and home wiring. Safe, secure and reliable! Following are packaged solutions. We can also meet your specific requirements that do not fit into the following packages. Note that the Watt hours are estimates and vary depending on the solar radiance. Price (see Off Grid SBE-PV Kits button at top of page) do not include shipping, installation or applicable taxes and may change daily. For current pricing: 705-562-0702. The perfect starter system for charging a battery in that backcountry cabin! Provides up to 4.5 amps of current in full sun, and plenty of power for 12V DC lights, a radio and a small pump. Set up is easy: simply secure the Sharp 80 watt solar panel to the roof with the adjustable mount provided, run the power cable down to the regulator, connect to the battery, and begin charging. Now that cabin or cottage can rock! With 250 watts and 14 amps of DC charging power, there is plenty of juice for lighting, music, water and other amenities. This system features a charge station with battery volt meter and charge current, plus LED indicators of battery status. A complete kit includes solar panel mount, cable, charge controller and installation instructions. The AHES is designed for a year round residence or large summer home. Three Sharp 235 watt solar modules quickly charge a 12V battery bank. MPPT charge control gets more power from your solar array. A 2800W Magnum sine wave inverter feeds clean 120VAC power into your electrical panel. Installation is made easy with Power House solar mounting system and a pre-assembled inverter E-Panel. Electricity 24 hours a day – without the noise of a generator! Standard off Grid PV Kits are shown on next page. Press the Off Grid SBE-PV Kits button at the top of this page. Also use the Power Consumption Calculation page to calculate your power consumption to determine the size of PV system to match you electrical needs. For non-standard kits please contract lisk.lesj@gmail.com.